Not far from the Bund district in Shanghai, with its hordes of tourists and view of the city’s famous skyscrapers across the Huangpu River, is a quiet neighborhood called Hongkou. Walk here along Zhoushan Road and you’ll stumble on a sign that signifies an otherwise unremarkable building at No. 59 as a landmark. The marker offers a clue to the hidden Jewish history of Shanghai and the incredible story of thousands of Jews who fled the Nazis and found refuge here in what was the Far East’s only Jewish ghetto. Among them was Blumenthal, who fled Europe with his family, spent part of his youth in Shanghai, then moved to the U.S. and served in the late 1970s under U.S. President Jimmy Carter. The best way to learn about this unusual slice of Jewish and Shanghai history is on a tour with an Israeli expat named Dvir Bar-Gal. But be warned: This is no superficial glance at the highlights; this is a five-hour, $60 mini-course with Bar-Gal as professor. With his encyclopedic knowledge and intense passion, he brings to life a vanished world, attracting visitors from every continent, many of them descended from the Jews who only survived World War II because they found refuge in Shanghai. Bar-Gal begins the tour on the bustling Bund, explaining how Jewish merchants from Baghdad helped build Nanjing Road into the neighborhood’s commercial center in the 19th century. The landmark Peace Hotel, now owned by the Fairmont chain, was built in the 1920s by Victor Sassoon, part of a famous and wealthy Sephardic Jewish family. Among the community’s rags-to-riches tales was that of Silas Hardoon, who started as a night watchman for the Sassoons and became a powerful real estate developer, helping to turn Nanjing Road into the “Fifth Avenue of China” in the early 20th century. “Eventually he became the richest Jew in Asia, the real estate king of Shanghai,” Bar-Gal said. The Kadoorie family, which founded the China Light & Power Company and today owns the Peninsula Hotel Group, is also descended from Sephardic Jews who got their start with the Sassoons. A second layer was added to Shanghai’s Jewish community when several thousand Jews fleeing persecution in Czarist Russia arrived here at the turn of the 20th century. Many settled in Shanghai’s French Concession district and opened small businesses. The third layer of Shanghai’s Jews consisted of European refugees fleeing the Nazis in the 1930s. Walking past small shops and tenements in Hongkou today, past street vendors and bicyclists, all of them Chinese, Bar-Gal said: “Imagine here a deli, a bakery, a grocery, a restaurant, a pharmacy,” run by Jews trying to recreate familiar rhythms of European life in their new city. So many of the residents were Austrian that the area was known as Little Vienna. A Chinese diplomat who worked in Austria during World War II, Feng Shan Ho, is part of the story. Defying orders from his superiors, Ho issued lifesaving visas that allowed Jews to leave, most of them traveling by boat from Italy to Shanghai. Shanghai was open to Jewish arrivals despite the fact that the city was under control of the Japanese, who were Nazi allies. A Japanese diplomat in Lithuania, Chiune Sugihara, also issued thousands of visas that allowed Jews to escape Europe for Japan or China. But eventually Japanese officials forced all “stateless” people living in Shanghai to move to Hongkou, and turned it into a ghetto. Some 20,000 Jews were crammed into the neighborhood, living as many as 30 to a room, Bar-Gal said. Disease and starvation were rampant, though the Jews tried to help themselves by setting up clinics, soup kitchens, schools and shelters. “Where we walk today, we are in the heart of the ghetto,” Bar-Gal said. A stone monument in Huoshan Park, a peaceful place with trees and benches, offers a description of the neighborhood in Chinese, Hebrew and English as a “designated area for stateless refugees” bordered by Gongping, Tongbei, Huimin and Zhoujiazui roads. But many buildings that once housed the refugees have been torn down, and more are slated for demolition. Bar-Gal’s tour also stops at the Shanghai Jewish Refugees Museum and Ohel Moshe synagogue, where artifacts like passports, photos and a newspaper produced by the refugees are on display. The tour ends inside a tiny, dark apartment that once housed Jews and is now inhabited by several Chinese families. Here Bar-Gal, who is writing a book, describes another of his projects — an effort to find “the lost Jewish cemeteries of Shanghai” and create a memorial. He has found tombstones from the destroyed graveyards in towns and villages, in one case being used as a washboard. The Museum of Liverpool will launch 100 years to the very day that its iconic neighbour the Royal Liver Building opened its doors. The largest newly-built national museum in Britain for more than a century, the new Museum of Liverpool, will open to the public for the first time on Tuesday 19 July. One of the world’s leading history museums and a stunning new addition to the city’s famous waterfront, the Museum of Liverpool is the first national museum anywhere in the world that is devoted to the history of a regional city. Demonstrating Liverpool’s extraordinary contribution to the world, it will showcase popular culture and tackle the social, historical and contemporary issues of the city. Professor Phil Redmond CBE, chairman of National Museums Liverpool said: “Liverpool’s waterfront is known the world over, and we are pleased that we will soon be welcoming visitors to what is undoubtedly a stunning addition to that World Heritage Site. Until now, people have found it difficult to grasp the sheer size of the birds that perch on top of what was once the tallest building in Britain. Now visitors to the new Museum in July will be able see for themselves the magnificence of an 18ft life-size Liver Bird, overlooking the Three Graces. Both the Liver Building and Museum of Liverpool are considered cutting edge architectural designs in their own right. 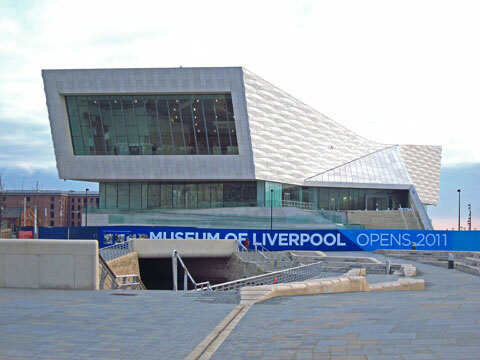 The Museum is the newest symbol of Liverpool’s confidence as a great 21st century city. Housing more than 6,000 objects, many which have never been on public display before, visitors can unearth an array of stories spanning the Ice Age to the present day. People will be able to see the stage where John Lennon and Paul McCartney first met, witness the city’s growth into the world’s greatest port, see first hand the last remaining carriage from the famous Liverpool Overhead Railway, and immerse themselves in the city’s rich sporting and creative history. David Fleming, director of National Museums Liverpool said: “The Museum of Liverpool is all about telling the stories of the city and its people. This includes the times of struggle such as the Toxteth riots, the triumphs of our musical exports including The Beatles, and the dramatic histories of our football teams. The £72m project is continuing apace, and internal fit-out of the major galleries is taking shape to such an extent that the three-phased opening of the Museum has been reduced to just two, with the second phase opening later this year. Discussions regarding plans for the launch day are currently taking place, and will be announced nearer the date. 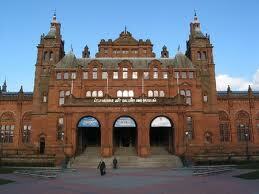 The museum’s collections originally came from the McLellan Galleries and the old Kelvingrove House Museum. Donations and acquisitions over the years have increased the collection, including, most famously, “Christ of St. John of the Cross” by Salvador Dali, purchased direct from the artist by the museum’s then curator in the early 1950s for £8,200, a price considered very high at the time, even though Dali had been bargained down by a third from his original asking price and the sale included copyright to the image. The collections are displayed in 22 state of the art galleries. Amongst the artworks on display are paintings and sculpture from all periods of history, including works by Van Gogh (“Portrait of Alexander Reid” (once thought to have been a self-portrait)), Rembrandt, Botticelli, Turner, Millais, Whistler, Picasso, Monet (“Vetheuil”), Mary Cassatt *”The Sisters”) and L. S. Lowry (“V.E. Day”). Scottish works on display feature influential art from the Glasgow School of the late 19th and early 20th century including George Henry & E. A. Hornel, William Kennedy, Sir James Guthrie and “Motherless” by George Lawson. 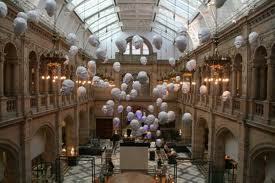 More contemporary work is also on display including Sophy Cave’s “Floating Heads” (more than 95 disconnected heads showing the whole rage of human expressions) hanging from the ceiling above the museum’s famous pipe-organ and Avril Paton’s “Windows in the West”. The Kelvingrove features more than just art, and amongst the natural history galleries, “Sir Roger” – a stuffed elephant (shot after a hormonal disorder made him extremely aggressive at Glasgow Zoo) – is a favorite with visitors, while a fully restored Spitfire hanging from the ceiling is a highlight of the scientific and technological displays. The decorative arts collection reflects Glasgow’s maritime trading heritage, as well as the expeditions of David Livingstone, with art and artifacts from dozens of cultures all over the world, including ceramics, glass, furniture, silverware, costumes, textiles and metal work. One gallery features a recreation of a Charles Rennie Mackintosh style dining room, emphasizing his importance to the history of art and design in Glasgow. The Kelvingrove is famous for its collection of arms and armor, including the ‘Avant’ armor (the earliest near-complete set of armor in the world, darting from around 1440), William Herbert, first Earl of Pembroke’s complete armor for man and horse (made by the Greenwich Royal Workshop in 1557) and rare medieval Scottish weapons amongst broad displays of European armor and weaponry. The Kelvingrove has had a long reputation for holding major exhibitions, including the ‘Dead Sea Scrolls’ (1998) and Frank Lloyd Wright (1999) shortly before it’s refurbishment. This tradition has continued since the museum reopened, with temporary exhibitions now held in a the RBS Exhibition Gallery. “Pioneering Painters: The Glasgow Boys 1880-1900” which was on display during 2010 set new records for visitor attendance, and showed 100 oil painting plus 50 works on paper by this influential Glaswegian group. The first exhibition dedicated to the Glasgow School since 1968, a condensed version of this exhibition is currently on view at the Royal Academy of Arts. The next exhibition to open at the Kelvingrove will be “Drawing (on) Riverside: An Exhibition by Patricia Cane”, which opens on April 15th and runs until August 14th 2011. Kelvingrove’s recent exhibition of work inspired by the construction of the Riverside Museum in Glasgow (housing the new museum of travel and transport) featured works by Patricia Cain, a Glasgow lawyer turned artist, who won the Aspect prize (Scotland’s premier prize for painting) in 2010 for her forensically detailed studies of the museum under construction. “Drawing (on) Riverside: An Exhibition by Patricia Cane” will be the artists first major solo exhibition and will draw on the works previously exhibited. We at the gallery are using a lot the internet to find stuff… This week I would like to recommend to you a great website that deals with movers, moving services, storage and packing services. Whether you are an art gallery or an individual looking for a mover or a packaging services, you should check out MyMove. 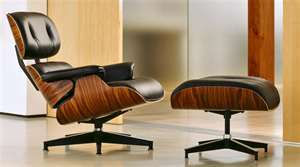 We have used their service a couple of times now and they are very reliable with great expertise. Check them out, and say hi to Shimon from us, you might get a 5% discount! The new Acropolis Museum opened today. It is located 300 meters from the famous ruins, and cost $181 million to build. Today, the new Acropolis Museum has a total area of 25,000 square meters, with exhibition space of over 14,000 square meters, ten times more than that of the old museum on the Hill of the Acropolis. The new Museum offers all the amenities expected in an international museum of the 21st century. Athens may be one of the most congested cities in Europe, but you won’t feel it here, staring up at the Parthenon’s columns as they turn to gold in the evening sunlight. Suddenly, your high-speed city break will feel like a proper Athens holiday. The monuments of the Acropolis have withstood the ravages of past centuries, both of ancient times and those of the Middle Ages. Until the 17th century, foreign travelers visiting the monuments depicted the classical buildings as being intact. This remained the case until the middle of the same century, when the Propylaia was blown up while being used as a gunpowder store. Thirty years later, the Ottoman occupiers dismantled the neighboring Temple of Athena Nike to use its materials to strengthen the fortification of the Acropolis. The most fatal year, however, for the Acropolis, was 1687, when many of the building’s architectural members were blown into the air and fell in heaps around the Hill of the Acropolis, caused by a bomb from the Venetian forces. Foreign visitors to the Acropolis would search through the rubble and take fragments of the fallen sculptures as their souvenirs. It was in the 19th century that Lord Elgin removed intact architectural sculptures from the frieze, the metopes and the pediments of the building. Fifty years after the realization of Frank Lloyd Wright’s renowned design, the Solomon R. Guggenheim Museum celebrates the golden anniversary of its landmark building with the exhibition Frank Lloyd Wright: From Within Outward, co-organized by the Solomon R. Guggenheim Foundation and the Frank Lloyd Wright Foundation. On view from May 15 through August 23, 2009, the 50th anniversary exhibition brings together 64 projects designed by one of the most influential architects of the 20th century, including privately commissioned residences, civic and government buildings, religious and performance spaces, as well as unrealized urban mega-structures. Presented on the spiral ramps of Wright’s museum through a range of media—including more than 200 original Frank Lloyd Wright drawings, many of which are on view to the public for the first time, as well as newly commissioned models and digital animations—Frank Lloyd Wright: From Within Outward illuminates Wright’s pioneering concepts of space and reveals the architect’s continuing relevance to contemporary design. The exhibition takes its title from Frank Lloyd Wright’s musings on the importance of interior space in shaping and informing a structure’s exterior. “The building is no longer a block of building material dealt with, artistically, from the outside,” Wright said. “The room within is the great fact about building—the room to be expressed in the exterior as space enclosed.” Few designs in Wright’s oeuvre so well illustrate the concept of designing “from within outward” as the Guggenheim Museum, in which the interior form gives shape to the exterior shell of the building. During his 72-year career, Frank Lloyd Wright (1867–1959), who died just six months before the opening of the Guggenheim, worked independently from any single style and developed a new sense of architecture in which form and function are inseparable. Known for his inventiveness and the diversity of his work, Wright is celebrated for the awe-inspiring beauty and tranquility of his designs. Whether creating a private home, workplace, religious edifice, or cultural attraction, Wright sought to unite people, buildings, and nature in physical and spiritual harmony. To realize such a union in material form, Wright created environments of simplicity and repose through carefully composed plans and elevations based on consistent, geometric grammars. Frank Lloyd Wright: From Within Outward is organized in a loosely chronological order and is installed to be viewed from the rotunda floor upwards. Off the first ramp in the High Gallery is an original curtain depicting Wright’s native Wisconsin landscape from the 1952 Hillside Theater at Taliesin, Wright’s home and studio in Spring Green, Wisconsin (1911–59). On loan from Taliesin, this curtain creates the backdrop for a sound installation of recorded oral histories from the collection of the Frank Lloyd Wright Foundation, which feature the voices of clients, friends, apprentices, and architects reflecting on the revelatory experience of living and working in Wright-designed spaces. Highlights of Frank Lloyd Wright: From Within Outward include newly created three-dimensional scale models that examine the internal mechanics of functional space in relation to exterior form in a variety of Wright’s projects. Among these are an exploded version of the Herbert Jacobs House (Madison, Wisconsin, 1937); a mirrored model for Unity Temple; and a sectional model of Beth Sholom Synagogue (Elkins Park, Pennsylvania, 1953). Large-scale models of unrealized urban schemes for projects, including his Plan for Greater Baghdad (1957), the Crystal City for Washington, D.C. (1940), and the Pittsburgh Point Civic Center (1947), provide insight into Wright’s visions for the landscapes of the city. The models were developed by Michael Kennedy of New York–based Kennedy Fabrications Inc., which specializes in architectural models and prototyping, and Situ Studio, a Brooklyn-based firm focused on research, design, and fabrication. The Legacy of Frank Lloyd Wright In 1990, the Solomon R. Guggenheim Museum was declared a landmark by the New York City Landmark Preservation Commission and in 2005 was listed on the National Register of Historic Places. On October 7, 2008, the Interior Secretary of the United States named the Guggenheim a National Historic Landmark in recognition of the museum’s significance within American history and culture. UNESCO World Heritage Center also is considering Wright’s legacy: ten of the architect’s most relevant buildings, including the Guggenheim Museum, Taliesin, and Taliesin West, his home and studio in Scottsdale and the headquarters of the Frank Lloyd Wright Foundation, have recently been included on the United States’ World Heritage Tentative List, which identifies the most significant cultural and natural treasures worldwide. Exhibition Tour Following the presentation of Frank Lloyd Wright: From Within Outward at the Solomon R. Guggenheim Museum in New York, the exhibition will travel to the Guggenheim Museum Bilbao in Bilbao, Spain, where it will be on view from October 6, 2009 through February 2010. Publications Frank Lloyd Wright: From Within Outward is accompanied by a fully illustrated exhibition catalogue published by Skira/Rizzoli. With forewords by Phil Allsopp, Richard Armstrong, and Thomas Krens, the catalogue will include essays by Wright scholars Richard Cleary, Neil Levine, Mina Marefat, Bruce Brooks Pfeiffer, Joseph M. Siry, and Margo Stipe. A hope the Jewish Museum Berlin has had for some time is now to be realized: The Museum will be granted its much-needed expansion into the area on the opposite side of the road which currently houses Berlin ’s Central Flower Market. The space provided by expansion into the market hall will satisfy the Museum’s urgent need for additional room for educational programs, the archive, the library, and research. André Schmitz, State Secretary for Cultural Affairs in Berlin , has approved the project, ensuring that the state of Berlin will hand over the use and management of the whole hall to the Jewish Museum Berlin . The Friedrichshain-Kreuzberg District Authority is seeing to the alteration of the land-use plan for the area between Lindenstrasse and Friedrichstrasse, in which the Central Flower Market premises are currently a designated “mixed-use” area. This will enable the hall to be used as a cultural center in future. The building planned by the architect Bruno Grimmek between 1962 and 1965 will not be demolished, but merely modified to suit the requirements of the Jewish Museum Berlin . Construction work can begin in 2010 when the approximately 6,000 m² hall will be vacated by the Berlin Central Market, which will move to the Beusselstrasse. The costs are estimated at 10 million euros, of which the state – under the direction of Bernd Neumann, Minister of State for Cultural and Media Affairs – will cover 6 million. The remaining 4 million euros will be raised by the Jewish Museum Berlin through sponsors. Amongst the Museum’s supporters are a generous sponsor from the US and the American Friends of the Jewish Museum Berlin : Their gift to the Museum is the design for the hall’s modification, for which it is hoped the Daniel Libeskind Studio can be won. Berlin ’s Kreuzberg district would thus gain a further architectural attraction, which alongside the Libeskind Building and Libeskind-inspired Glass Courtyard would complete the Lindenstrasse ensemble – without burdening public coffers with the expense of a star architect’s design. The expansion has become necessary due to the growth of the education and research areas at the Jewish Museum Berlin . The new building is to bring the education department, the archive, and the library under one roof, thus creating synergies between scientific research and educational work. Direct access to information, a clearer overview of what is on offer, and more room for exchange, transfer of knowledge, and encounters – the new location will ensure all these. The objective is to establish in the Lindenstrasse in Berlin one of the most important research and education centers on the history and culture of German-speaking Jewry. Since the opening of the Jewish Museum Berlin in 2001, its educational work has more than doubled. In addition to the roughly 7,000 guided tours each year, the Museum holds around 300 educational events such as training courses, seminars for students, vacation programs, workshops on special exhibitions and Jewish festivals, workshops about the archive featuring talks with witnesses, theater workshops, programs against antisemitism, project days, and training courses for teachers. Over 100,000 visitors per year come to these events. Furthermore, at least 10 times a year the Jewish Museum Berlin hosts large-scale educational events with up to 300 school pupils, for example as part of international youth meetings or commemoration days for schools such as the Anne Frank School. This diverse range of activities and the increase in demand, particularly where whole-day activities are concerned, has resulted in a space shortage that will be solved with the expansion into the Central Flower Market hall. It will enable more events to be held at the same time and a clearer representation of findings. More space will also be available for educational work on a theme the Museum intends to bring into sharper focus: Integration, understanding, and tolerance in a multiethnic society. Moreover, the spatial proximity of the archives, library, seminar rooms, workshops, and multimedia activities will ensure more efficient logistics in the organization of events. Last but not least, it will take the pressure off the flow of visitors into the Old Building and the Libeskind Building , which are frequented by more than 750,000 people a year visiting the permanent and special exhibitions. The archival holdings of the Jewish Museum Berlin have likewise more than doubled since its opening. 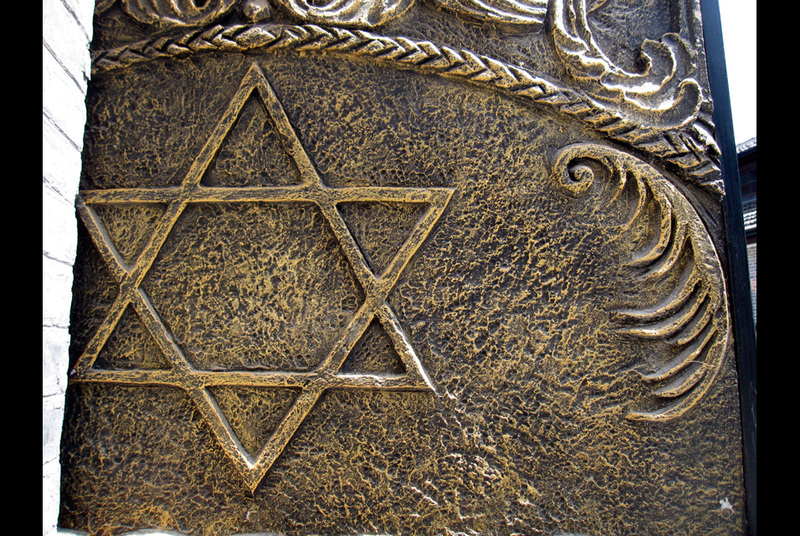 Further growth is expected in the near and mid-term future, since the last generation of Holocaust survivors is passing away. The Jewish Museum Berlin (JMB) has the task of conserving this heritage by continuously adding to its collections. Furthermore, the archive would like to expand its holdings on postwar history of Jews in Germany . In addition, there are the dependencies of important archives on German-speaking Jewry housed at the JMB: The holdings of the dependency there of the Leo Baeck Institute New York Archive have quadrupled since 2001. The Jewish Museum Berlin opened a dependency of the Wiener Library London in 2008. In cooperation with the British partners, the holdings, which have so far not been inventoried, are to be made accessible at the JMB. The number of users has also risen appreciably: The holdings of the Jewish Museum Berlin , the Leo Baeck Archive, and the Wiener Library are in international demand. Inquiries from researchers come not only from Europe, but also from other parts of the world such as Israel , the USA , and Canada . The extension will not only ensure improved conditions for using the materials, but will also provide more space for collaboration with universities and other scientific institutions – an area that is to receive sharper focus. Alongside a fellowship program, more scientific events such as conferences, meetings, and lectures are planned. The library at the Jewish Museum Berlin will also move into the extension. Initially planned as a reference library for employees, it originally housed around 70,000 media and has been used as a specialist reference library since 2001. The holdings have trebled in the past 10 years. As well as literature on German-Jewish history, culture, literature, music, art, and other humanistic sections, it also boasts a historical collection whose oldest book dates back to the 14th century. In 2005, the library began to collect audiovisual materials and thus became a media center. Hidden away at the back of the Libeskind Building , the current library is not in a part of the Museum to which the public has free access. Therefore prior notification is required of its visitors, who are then accompanied by staff to and from the reading room. In the new building on the opposite side of the Lindenstrasse, the library rooms will be freely accessible making use of them easier and thus more attractive.